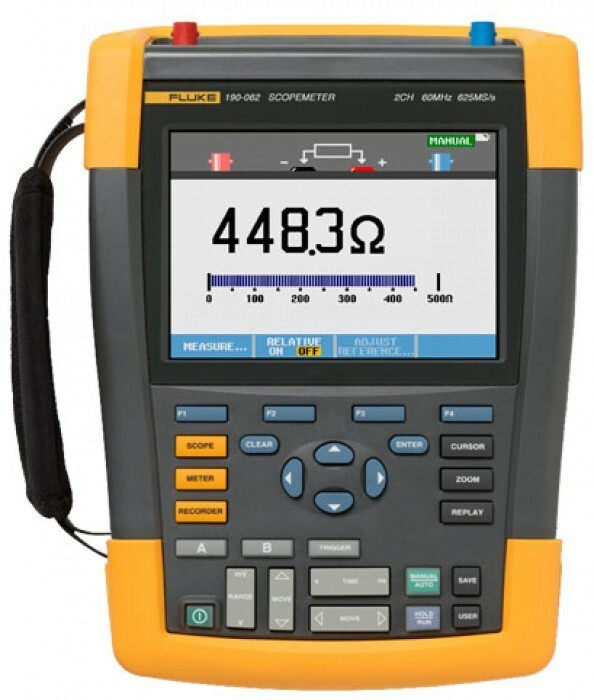 The FLUKE 190-062 ScopeMeter oscilloscope has two electrically isolated channels, and is safety rated for industrial applications. This scope combines rugged portability with the high performance of bench oscilloscopes. Its 60 MHz of bandwidth, 625 MS/sec sampling rate, and deep memory of 10,000 samples per channel allows high-accuracy capture and display of waveform details, noise, and other disturbances. Perform timing or amplitude related measurements on three phases or three-axis control systems or simply compare and contrast multiple test points in a circuit under test. Features like TrendPlot™, ScopeRecord™, and Connect-and-View™ help you quickly diagnose industrial machinery, automation and process controls, and power electronics to minimize repair costs and downtime. These features make the oscilloscopes easy to use especially when diagnosing the most difficult problems like complex waveforms, intermittent events and signal fluctuations or drift. New Li-ion battery technology keeps your scope on the job, all day.